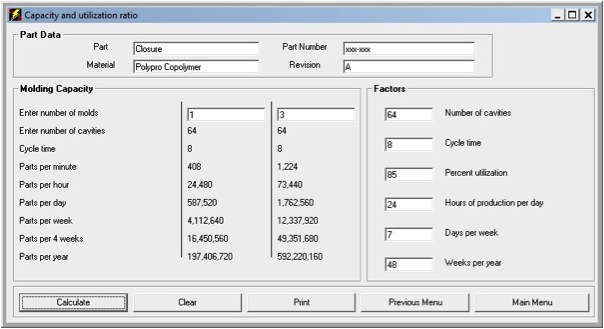 DZynSource Mold Engineering Software automates many of the calculations that can be used designing, checking, and troubleshooting plastic injection molds. 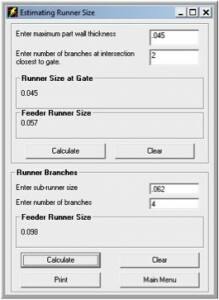 DzynSource is easy to use; for most features simply choose the calculation you want to perform, enter the known data, and press Calculate. The answers appear quickly. Think how much time this will save you the next time your customer calls and asks “How many gallons per minute of water do we need to run this mold?” or “How many gallons of oil per minute does our pump need to supply for the cylinder?” Or when you need to know if the mold plate you’ve chosen is strong enough to keep that “A” side action from stretching to the point of flashing. 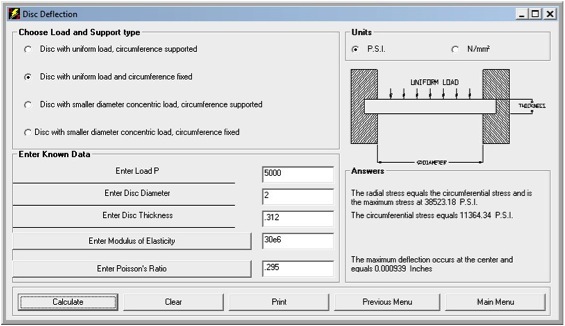 At $197, this mold engineering software is a tool that you can’t be without. There will be times where each use will save you hours of time. Some calculations are complicated, and can take an hour or more, if not done regularly. Instead of looking through notes and books for the appropriate formula or equation, all of your engineering calculations are automated in one convenient location. Have you ever seen an “A” side action mold flash due to an under-designed plate? Imagine the money saved if you avoid just one engineering mistake!